As William Gibson may or may not have said in 1992, “The future is already here — it’s just not very evenly distributed.” So how can we make sure it is? 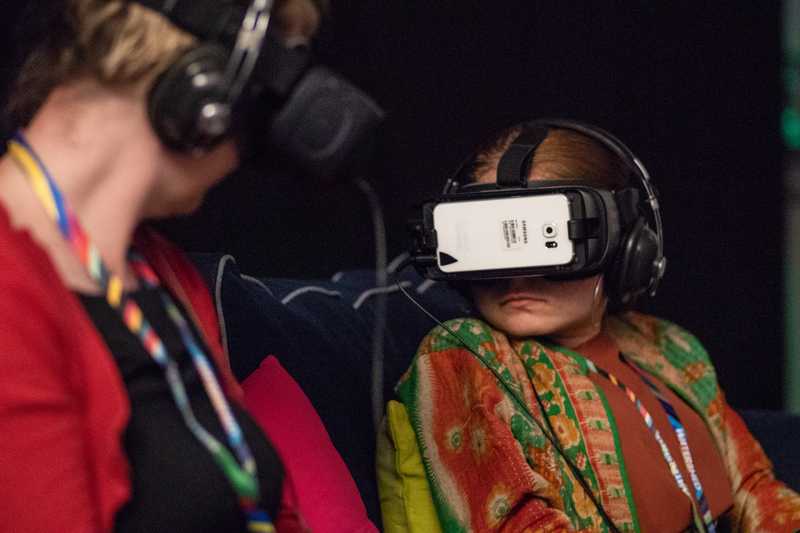 How do we understand the opportunities and barriers that technology catalyses for disabled artists and the culture sector as a whole? Clare Reddington, CEO at Watershed, is our final chair for Unlimited: The Symposium, leading the Future panel with guests Kamal Sinclair, James Hilton and Jonny Cotsen. Here she shares some of the themes and questions they will explore. Though tech companies are rarely out of the headlines – our trust in them is at an all time low. And, though the internet is used by the majority of people living in the UK, the people making technology remain largely the same: according to the annual Technation survey, women in the tech industry are outnumbered 4 to 1 – and data on disability in the workforce is not even currently collected. Watershed’s Pervasive Media Studio seeks to enable people to create inclusive, transformative experiences, using technology to challenge and shape our ideas of the future – taking tiny, magical slivers off the status quo. To do this, we believe you need to challenge and change every aspect of tech – from who makes it, to how we think about users, to what we want to do with it, to where it goes. This is as true for creative content as it is for the underlying code – and the voices of disabled people are vital in every part of this mix. In the US, Kamal Sinclair of Sundance New Frontiers edits a site called Making New Reality which reflects on the implications of narrow technology authorship. Whilst Kamal’s work is largely focussed on examining the barriers that people of colour face in the world of technology, the challenge and responsibility to create equality in the world of disability, are similar. “Just because the PlayStation won’t accept an Xbox game, doesn’t mean it’s broken. Not all features of atypical human operating systems are bugs”. He goes on to offer practical ways for companies to think of diversity as a creative asset (again, as long it is inextricably linked to equality). The notion of difference as an asset is covered in Raising the Bar – a podcast from Reply All, which offers great examples of how engaging people with different experiences leads to problems being solved faster and better. Listen to it and you will never think of ketchup in the same way again. In the past year – largely through our allyhood with Unlimited, the Pervasive Media Studio community has been enriched by residencies from deaf and disabled artists including Aidan Moesby, Jane Gauntlett, Raquel Meseguer and Jonny Cotsen – all asking exciting, new and different questions of technology, to push forward their practice, create innovative options for access and offer audiences new experiences. Theatre maker Jonny explores language, communication and the differences between deaf and hearing people in his work – and he is currently building a prototype hearing aid which transports hearing people into a deaf person’s world (with all accompanying extra sensory experiences such as traffic, mobile phones, birds, smells of food and pollution). Some time ago I heard Tom Morris of Bristol Old Vic being asked to define what makes an artist. He said (and I paraphrase) that the special thing about artists is 1) they can see round corners, and 2) they take you with them. Jonny’s prototype seeks to use technology to take you around a corner, it acts as a tool to share experience. Crucially, he is sharing his own experience (rather than appropriating other’s – a scary facet of the VR wild west), which we believe will achieve something extremely meaningful for himself, for audiences and for our understanding of what technology is for. Myself, Kamal, James and Jonny will be looking around the corners of technological change at the Unlimited Symposium in September – do join us in person or online. And, if you have them, please come ready to share examples where you think technology has been used transformationally and where you think the art world still has work to do.